What’s Happening With The MVA? The Deck Project Needs You! The MVA has an exciting opportunity to build an outdoor, covered deck area (6.45m x11.35 m) and a new disability access way on the Eastern side of the Montville Village Hall. The proposed deck will provide a flexible space linking the existing kitchen and dining areas with the outdoors and the amazing view over Hunchy . Architect David Gole has designed a deck that responds sensitively to our unique local environment. The extension will improve disability access to the hall and create a usable space for people to share in community activities. The plans will be on display at the next Growers and Makers Market on the 8th September. 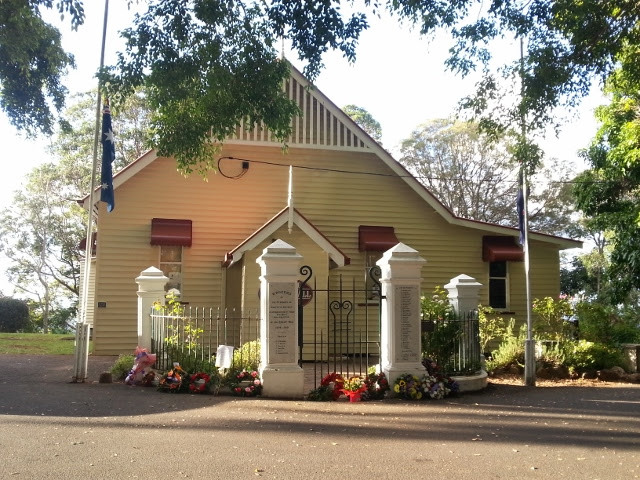 The Montville Village Hall has been a vital social hub on the Blackall Range since it was built in 1903 when the community raised £67 and built the hall on land donated by Edward Smith. The Montville community has a long history of working together to maintain and improve our Village Hall. Our deck extension will ensure the ongoing viability and sustainability of the hall. The deck will provide a beautiful space for you to enjoy your pancake breakfast at the Montville Growers and Makers Market while catching up with friends and appreciating the view. The deck also represents an important investment in the hall as a popular wedding location. We are building a space where our community can grow. The Montville Village Association aims to raise $25,000 to ensure the completion of this project. We would like to ask our local community to help us reach this goal. All donations are welcome and may be tax deductable. Please email treasurer.mva@gmail.com with the details of your payment so that you can receive a receipt.